This month's newsletter brings you an eye-opening report debunking the ivory/terrorism financing myth, articles on the first-ever prosecution of cultural destruction as a war crime at the ICC, an amazingly rich tomb and underwater discoveries in Greece, seizures in France of a Picasso and in the US of cuneiform tablets, museum exhibitions and a highly successful teaching tool using art objects, a major statement by the AAMD on safe harbor for antiquities, an extended summary of the Conflict Antiquities event at the Metropolitan Museum, and for a little relief from the seriousness of it all, pigs rooting out archaeological evidence and a transformation of Lenin into Darth Vader! Lest you forget – the end of year window for making a tax-deductible donation to the Committee for Cultural Policy will soon close. Please make a generous contribution and continue to make our educational work possible in the coming year! Please send your check to the Committee for Cultural Policy, Box 4881, Santa Fe, NM 87502 or contact us at info@committeeforculturalpolicy.org to find out more! 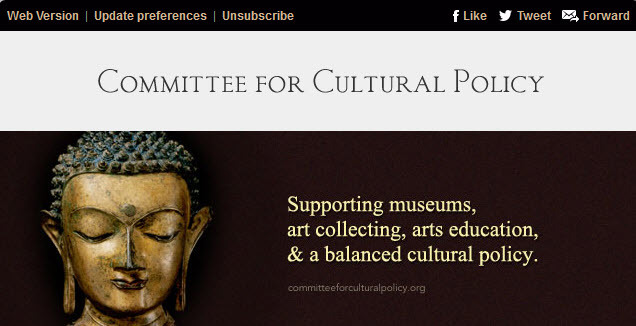 Committee for Cultural Policy is a U.S. non-profit educational organization.